Many thanks to Pev, dshinsel, subpilot, BauerMech, and everyone who helped me figure this out. I'd like to add some of the code I wrote to the wiki but I don't see to have access. Fantastic job on the blog! I've tried to create a "standard" look to the sections but it is still very much work in progress. Feel free to add or modify anything. Any contributions will be very much appreciated. Does anyone have a link to the specifications of the electrial output of the GWS PG-03 Gyro? I'm looking for enough information to fake the signal such that I can hook a microcontroller up to the robobasic board's gyro input and have it believe there is really is a GWS PG-03 Gyro connected. I get the feeling the Gyro is PWM and has a zero reset signal, but that's all I know. Output is the same pulse as the input, but the pulse width is either stretched or shrinked depending upon the gyro activity. Picture a helicopter where the tail rotor is being controlled by a RC controller. User input controls the servo. But, the Gyro modifies the Servo pulse to compensate automatically for sudden movements (like wind). so, your microprocessor just needs to put out a pulse every 20ms, and vary the pulse width between 1 and 2 ms... for Gyro, I bet it's more like 1.5ms +/- 0.2ms or so. If you really need hard data, I an put my GWS on a scope and let you know the range I get. Thanks a bunch Dave, that really helps. I'm not to the point where I need hard data. I'm mostly brainstorming about fun stuff to do to my RN-1 and trying to determing how feasible my ideas are and how much work they might take to pull off. Btw, shouldn't your icon show your blue RN-1 riding on your RoboMagellan like you had riding in the RoboGames pits? ...aw man, I missed it! goes back to the downhill skier position again ??? Last edited by CaptKill4Fun on Sun Aug 06, 2006 7:03 am, edited 4 times in total. In the manual (page 93) it shows how two different brands need a different "module number". In their exmple a "1" is placed in front of the channel number for the KRG-1 gyro. Maybe Futuba requires a different number as well? The GWS works quite well... I haven't tried the KRG or Futuba models, so this is simply a guess. You shouldn't need to adjust the zero settings at all. Once the gyro's are on, your bot probably won't be perfectly perpendicular to the floor from the get-go. You will want to adjust the "setup" and gain pots to get him exactly upright. Last edited by CaptKill4Fun on Sun Aug 06, 2006 7:03 am, edited 8 times in total. By pressing button 1, turns gyro's off... 2 turns both of them on, 3 turns ony the fore/back on, and 5 turns only right/left sway on. Some other people have been asking, so I'll post this too: ...It's about everything I know about these. The key to making the gyros work well is in their placement and adjusting the pots inside each gyro. For forward/backward gyros, the shoulder works well. Just be sure it's facing the right direction (see pic). 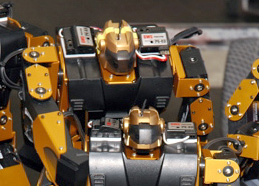 The way I have it set up is that gyro one is fore/back (robot's left shoulder in pic) and is connected to AD0 (gyro's pre-existing lead) and AD4 (lead you need to install) - gyro two (R/L sway - robot's right shoulder in pic) is on AD 1 (gyro's pre-existing lead) and AD5 (lead you need to install). Next, adjust the gain pot right between 1/3 and the half-way point. Then w/ the RN-1 on, set the setup pot so that your robot stands upright. The red and green LED's should light up simultaneously. You can tweak it as needed, but this should give you a good starting point. If you notice twitching, turn the gain down (slightly) and re-adjust the setup pot to compensate. When making the return lead from the gyro to the AD pin, only the signal is needed. You can leave out hte positive and the ground. If none of this works w/ your GWS PG-03, I don't know what to tell you. Maybe you have a defective gyro? Last edited by CaptKill4Fun on Sun Aug 06, 2006 7:04 am, edited 4 times in total. It is good to see people talking and stuff, but could you please use normal size font? I don't mind the color but the font size is like "WHOA IN YOUR FACE" type of font size and it burns my eyes =/ and also makes the page really wide. As for my question. What does the gryo do exactly? Just stabilize the robot so it can't be pushed over? Can it be used to stabilize the robot while its doing an action such as fly? Last edited by CaptKill4Fun on Sun Aug 06, 2006 7:04 am, edited 3 times in total. Oh, sorry and thanks a lot for making the font smaller This looks cooler also! What does the gryo do exactly? Just stabilize the robot so it can't be pushed over? Can it be used to stabilize the robot while its doing an action such as fly? It is not a cure-all, but does help tremendously with keeping your robot upright. We used exactly the same setup (as posted above) for the soccerbots at RoboGames. They competed on a "grass carpet/astro-turf" field. Even w/ the gyros, they would sometimes fall during a routine... but not as frequently as RN-1's w/o. During testing, I demonstrated the "fly" routine. While in the middle of it (bent over and standing on one leg) I could push him and he wouldn't fall over. Same held true when kicking (shooting). I don't know, but I wouldn't think you'd need to adjust your zero settings. Personally, I'd turn off the gyros, reset the zero points to where you originally had them, upload this .bas file to the RN-1, and go from there. It seems like you’re adding more steps than you need to... but that's just me. Regardless, I hope it works out for ya!